Yes, it's time to get your checklist out and get your doll all gussied up for another summer - after all you want to show her at her best. But where do you show her? 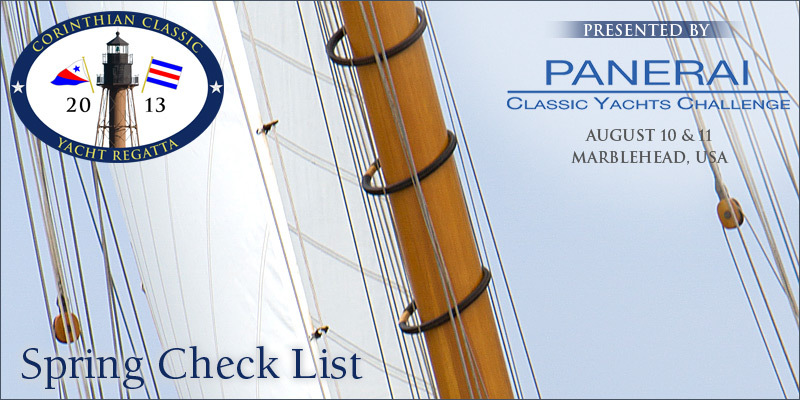 Put the Corinthian Classic Yacht Regatta - presented by Officine Panerai (www.panerai.com) - on your check list. It's the perfect venue for real enthusiasts. Put it on the check list: August 10th and 11th in Marblehead, USA. In celebration of the Concordia Yawl's 75th Anniversary, our featured speaker this year is none other than James "Sham" Hunt. The racing is "low key" but it is an excellent opportunity to stretch your sea legs, put your beautiful boat on display, and mingle with those who share your passion. You can expect that the Corinthian Yacht Club along with Panerai will put on a good show on and off the water for a very reasonable cost including free moorings (First come. First Serve.). The skippers bag is unbelievably good!